This book astounded me – it is gripping, breath-taking and incredibly moving. The plot was fast and amazing, the characters brilliant. Perfect. 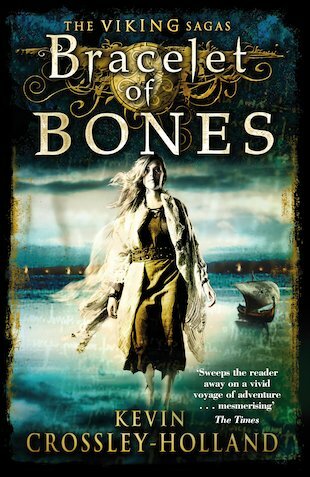 Bracelet of Bones by Kevin Crossley Holland is an exciting, fast paced historical story about a Viking girl in search of father. One day, Solvieg’s father, Halfdan, shows her a blackened battlefield and tells her how he will one day go to rejoin Harald Hardrada, who is leader of the Empress’s guard in Miklagard and Halfdan’s close friend. Next morning Halfdan has gone, leaving for Miklagard, and breaking her heart as well as his promise to take Solvieg with him. So she decides to follow him. Taking her father’s miniscule boat, she sets off on an epic journey across a seemingly endless sea. She meets many different people: from a slave girl to a Russian king, but will Solvieg ever find Halfdan? My favourite character in the whole book is Solvieg. It isn’t because she’s a main character, it’s because her affection for her father so clearly shows through and you really feel what she’s feeling, almost as if you are her twin. I think this book, as well as being a detailed and fascinating historical novel, shows that love is limitless and courage is rewarding. Thank you Kevin Crossley-Holland, for writing such a gripping and beautiful novel.